Fresh Lemon Royal Icing is my favorite to use for cookie decorating. It pairs nicely with sugar cookies, gingerbread, honey cookies and even chocolate cookies. I’ve been using Fresh Lemon Royal Icing since 2011. 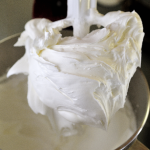 I created this icing recipe in an effort to add a bit more flavor to bland royal icing. And it just happens that lemon also helps to balance the sweetness of the icing. If this is your first time making royal icing let’s cover the basics first. Royal icing consists of meringue powder(dry egg whites), powdered sugar, liquid ( this can be water, strawberry puree,raspberry puree or even coffee). To flavor royal icing you can also add additional alcohol or water based flavorings. 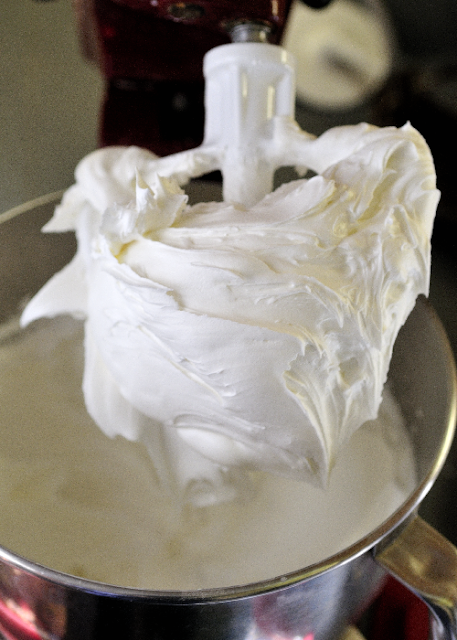 For those of you who follow a vegan diet you can use this Vegan Eggless Royal Icing recipe. Water and freshly squeezed and strained lemon juice. Then I add meringue powder, cream of tartar (optional). Lastly, I always add Vanilla Extract and often also Almond Extract. Lemon, Almond and Vanilla all together create a wonderful flavor. Wait a second, you don’t like lemon? If lemon flavor is not your thing, it’s okay. You can still make royal icing using this recipe. In place of lemon juice use water instead. Store royal icing in a closed container covered with a plastic wrap to prevent crusting. Fresh Lemon Royal Icing can be stored at room temperature for up to 2 weeks. However, I store unused icing in the refrigerator for up to 3 weeks. I prefer refrigeration as icing doesn’t separate as much as it does at room temperature. If longer storage is required you can follow these steps and learn more about how to Freeze and reuse frozen icing for cookie decorating. Use gel food colors. I mainly use Americolor Brand, some Wilton, Chefmaster. Make sure all your tools are grease free! I wipe my tools with a piece of paper towel and vinegar. Wipe dry with a clean towel. Sift the powdered sugar if needed, if powdered sugar has big chunks make sure you sift it, otherwise I don't sift. 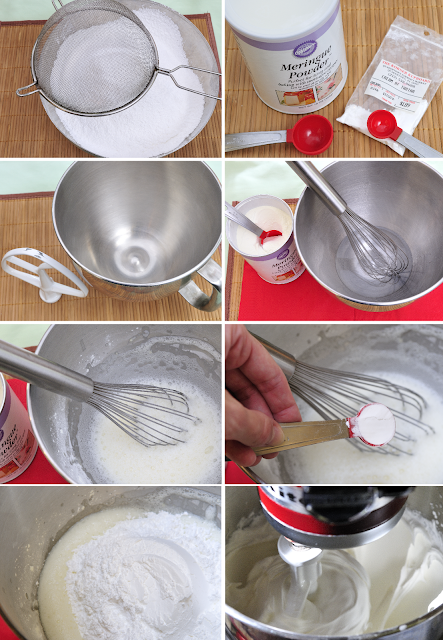 Whisk meringue powder with fresh lemon juice and warm water, until slightly foamy, add cream of tartar, whisk well and then add all the powdered sugar at once. Using your stand mixer, on the lowest setting, using paddle attachment, mix for about 3-4 minutes, add vanilla extract, continue mixing for another 5 minutes. Scrape the bowl once and beat again. When icing is done it should be stiff. Try not to overmix. For non lemon icing, use the same measurements, instead of lemon juice use water. How much corn syrup would you add to the royal icing recipe? Hi Margaret, per 2lb powdered sugar batch you can 1/4cup to 1/3 cup max. Hope it helps. Thank you for your reply Hani. What exactly does the corn syrup do for the icing? Does the icing still get firm on the cookies so you can stack them or put them in individual bags? Does the c.s. give the royal icing a shine? I read that once you flood royal icing onto cookies, place a fan in front of the cookies to help dry and make them shine. Does the fan help to keep the shine? We can’t get Meringue powder in our country, what can I use as a substitute? 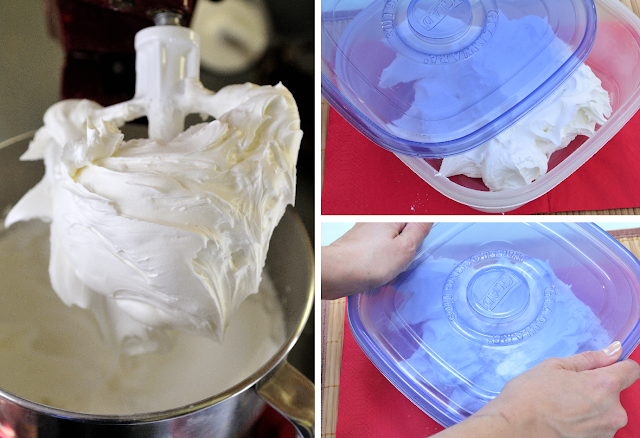 You can use chickpeas liquid to make eggless royal icing. Use about 6 tbl of the liquid strained from the canned chickpeas. Whisk it until foamy then add about 5 cups powdered sugar and beat until thick. Flavor with vanilla, lemon etc. Color with food colors. I’ll have recipe up in a few weeks. I have a royal icing recipe that has glycerin and corn syrup in it. I like this icing because it doesn’t dry rock hard, but you can still package and stack them. Do you think I could use these two ingredients in your lemon royal icing recipe? Hi Lee, yes definitely. I’ve used corn syrup with this recipe many times. Hi Lee, I have been looking for a recipe like that. Would you be willing to share that here? Thank you in advance! Hi Ely, are you looking for glycerin and corn syrup royal icing? How far in advance can I decorate the fresh baked cookies with royal icing for a birthday party and thank you? I am using you awesome vanilla cookie recipe and royal icing. It's alway's been a big success! Thank you for sharing you "successful" recipes and decorating tips. You are a wonderful gift to me as an amature baker for my grandchildren! God's blessings! Thank you very much for the recipes you’ve shared. I’ve seen almost all of your videos on utube, most of them twice. You are extremely talented and gifted in many culinary deliciousness categories. May God continue to Bless you. Hello dear thanx for yr wonderfully tutorials pls I want to make cup cake for my son and I want to decorate it with Lebanese flag it's for school project can u help what type of icing I should use for the decoration . Does the lemon juice effect the way to royal icing behaves? 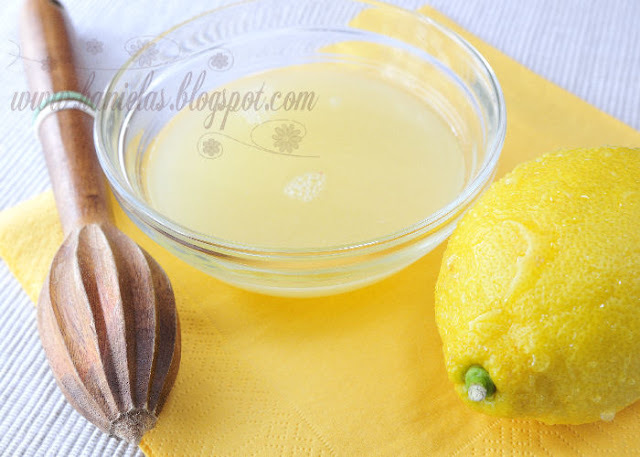 I have read not to use lemon extract because of the oil but love lemon flavor.